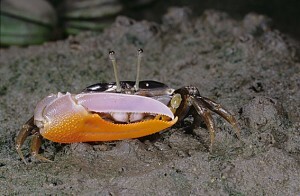 Large male claw has bottom finger and lower half of hand orange; upper part of hand grey to pink; top finger bluish white. To 30 mm across. Common. On unshaded sandy mud along lower tide levels of open bays and creeks and isolated sand or mud banks. Indigenous; northern Australia from Darwin, NT to Trial Bay, NSW.